Rowdy Rathore, right out of eighties’ Bollywood has been made in so many languages and done so well, that its success in Hindi is almost certain. In the Wanted and Dabagg genre of senseless entertainers, all Prabhudeva has to do it replace the Southern hero with a Bollywood one, get the lines translated, and let fly. There is a whole generation of young moviegoers, that hasn’t grown up on traditional Bollywood masala, and now find these loud, lewd, violent films ‘cool.’ The South evidently never gave up on this style of filmmaking. Salman Khan made a comeback riding on Southern remakes, Aamir Khan did Ghajini, Ajay Devgn didSingham, and now, maybe Akshay Kumar will turn his fortunes around with Rowdy Rathore. Oddly enough, this one has been co-produced by Sanjay Leela Bhansali, whose own films are never so ‘massy,’ but obviously, this is where the money comes in from. Even the NRI population is nostalgic for old-style Bollywood. A petty thief (Shiva) finds himself in a fix when a little girl calls him Papa. Turns out he has a lookalike in ACP Rathore, who is in the habit of making grand pronouncements and twirling his moustache. He has also made enemies in Devgarh, which is ruled by a cruel Bapji (Nasser). Even the local cops (Yashpal Sharma, Gurdeep Kohli) are helpless when faced with Bapji’s violence. 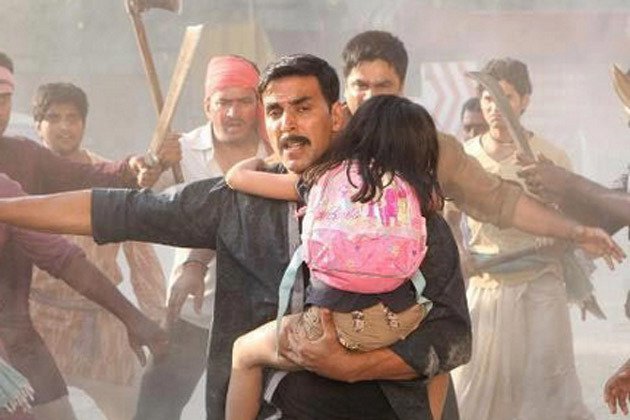 When Rathore rocks the boat, he is brutally attacked and left for dead. In the long tradition of double roles (China Town, Sachcha Jhootha, Kallicharan, Humshakal), the thief impersonates the cop and it’s no surprise to find that he thrashes armies of villains single-handed. Like every true-blue Bollywood film, this one has a romantic track too. Shiva falls in love at first sight with Paro (Sonakshi Sinha) and develops a fetish for her waist—among the many songs they dance to, one is devoted to her ‘chikni kamar’. Akshay Kumar gives it his best— comedy, action, emotion; there is enough to keep the entertainment seekers happy, including a rambunctious village item number. Still,Rowdy Rathore can’t get rid of the smell of mothballs that clings to it. Been there, seen that, paid tribute to it, got nostalgic about it, now do we have to keep going back to the Bollywood left so far behind?